Hello folks, especially those who have blamed me for hair loss, bags under eyes and furrowed brows after I posted my quiz! Don't forget to email me your answers by next Saturday night (9th)...I've had some already but I'm not saying anything about how many questions anyone has got right yet! I'll definitely be repeating the quiz idea though as quite a few people have requested more of the same. Coming up with new fiendish clues will give me something to do on my train journeys! Meanwhile, here are some cards that I've been making for this Saturday's demonstration at A for Art in Chesterfield....this one uses stamps from Darkroom Door's Art de Fleur vol 2 as well as the MS punch all over the page butterfly. The ribbon is from the Tim Holtz Lavish Trimmings pack - it's a lovely soft, silky ribbon which has a real vintage feel. I dyed it using Colourwash Dyes and lots of water to tone the colour down. The soft background is Bundled Sage and Aged Mahogany gently blended over 300gsm card with the flower stamped in Bundled Sage. The next card has the gorgeous roses from the same trimmings pack, again spritzed with Colourwash dyes and water. Confession here: I had just enough of a length of the roses to fit down the card if I slightly stretched the backing mesh as I stuck them down. I got a bit carried away though, and somehow managed to rip them! So, I stuck the short length at the top and the longer piece at the bottom and added the sentiment over the gap! I preferred how it looked, so it was definitely one of those "happy accidents"! The butterflies are Darkroom Door stamped directly onto the card (covered with paper from a Lost and Found stash) and then identical images stamped and cut out from acetate were overlaid. I used some of the new Stickles colours on the bodies. I also used more papers and the MS Vintage Lace PATP edger and corner to add to the Victorian feel. If you'd like to see these cards more closely (and more besides of course! )do pop along to A for Art on Saturday. There are some pictures from Sunday's workshops on my computer, however, because I couldn't find my camera, David took them using a different one and I can't find where they are! 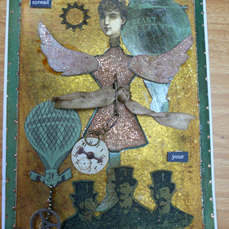 Still, here are a few cards from the day.....this is one of the Steampunk cards that we were making. I have been trying to use different colour combinations than my usual favourites and really liked the orange and aqua tones of this one. 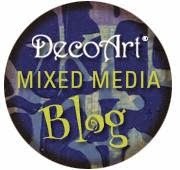 The stamps are a combination of Tim Holtz and Andy Skinner. You can't see it here, but the background does have some Perfect Pearls Mists on it to give a subtle shimmer. The other Steampunk card was the one that made the class overrun by ooohhh, only about forty minutes! There was lots of cutting out of Grungeboard by hand...I loved the Ranger canvas that was one of the projects at Stitches this year, so decided to make a small version of a mannequin. The clock face should be hanging down, not bashing that poor chap on the head! Didn't realise till after I'd uploaded the picture that it was stuck behind his hat! The next two cards were made by David who joined in the workshop this time! I think he's made a good job of them...note the artistic flicky pen border on this one! This one took him all day (and about a pint of Glossy Accents! In joke for the workshop ladies there!) as he was making it for Rena's birthday/retirement. Sorry about the chopped off piccie but this was kindly emailed over to me by Sheila as I didn't have a picture, and, for some reason, it decided to snip the picture. The funny thing about this card, which caused much hilarity, was that I had pre-stamped the words "Spread Your Wings" to save time for everyone. David chopped them into the three little panels to attach them to the card, but he mislaid the "wings" one. We searched everywhere but there was no sign and I had no spares. So, the card bears the message "Spread your"! Oh well, good thing Rena has a sense of humour! We had a lovely day and the workshops had a very calm (mostly!) yet fun feeling which ma de for a very creative time. After we'd finished David and I went to Rena and Stephen's house where they were holding a party to celbrate Rena's retirement and her forthcoming birthday on Tuesday. The house was full of family, friends and what seemed to be about 83 children (but was probably only eight!) having great fun both inside and in the garden. It was a lovely evening (check out Amy's blog for pictures of the amazing cake that Rena's sister Julie made) but I know that everyone will really miss seeing Rena at the shop. I'll finish with a page from my journal that I did after my trip to Whitley Bay. I used Gesso and NeoColour pastels for the background. My lady doesn't look quite how I wanted her to, but the page does remind me of my paddling in that cold sea water, so I don't really mind! Well, that's all for the moment, but I'll be back soon with more pictures. Oh, by the way, you may possibly find one or two of the answers to the quiz in this latest post! Oh, what a tease I am! Rofl - yes you are a tease! You may just have given me the answer to the q. I couldn't get (figers crossed!). Some beautiful designs here esp. the Steampunk (David did well too). Looking forward to your visit to Thame in May. Fabulous post with all those amazing and quirky cards. I so wanted to do that workshop, maybe another time eh? I have noted a lot of the answers except the 1 I need!!!! !